Know a person by his or her house. 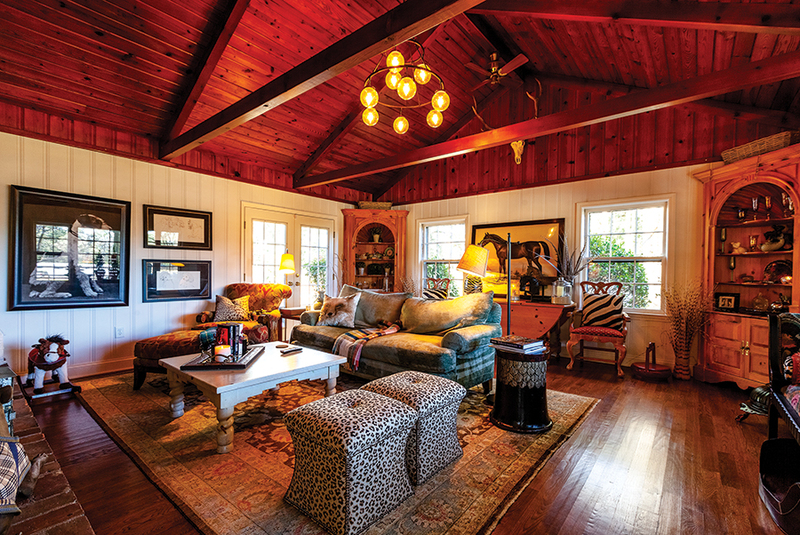 In the case of Denise O’Reilly, horse art, dog art, windows overlooking a paddock, the color turquoise, magazine-perfect decor located a few yards from her daughter and grandchildren tell the story. 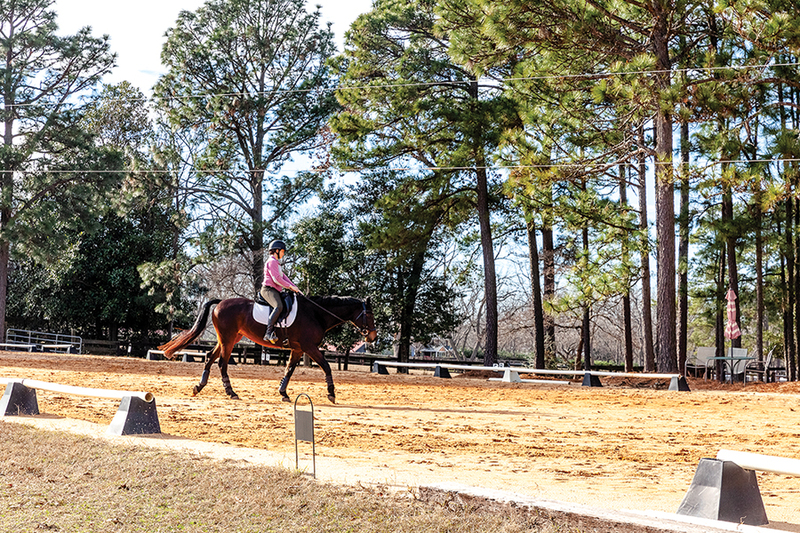 Denise — equestrienne, interior designer, part-time May Street resident who summers in Florida — helps daughter Lindsay O’Reilly operate Tanglewood Farm Bed and Breakfast, where guests, riders or not, soak up the atmosphere provided by dogs, horses, chickens, rabbits and a big yellow barn cat. Here, political wrangling and faraway conflicts are drowned out by whinnies and clucks. Of course, operating a B&B is more changing sheets and scrubbing tubs than pouring coffee and serving eggs Benedict. First, Lindsay’s husband, Randy Sharpe, a personal trainer, had to be convinced. Considering these circumstances, finding Tanglewood with its farmhouse and outbuildings was near miraculous, especially because the cottage demanded upgrading and Denise possessed the skills. 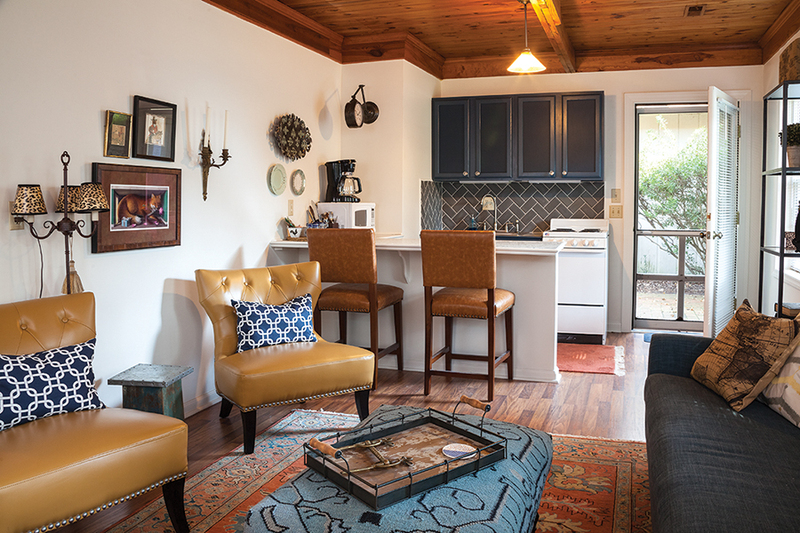 “When I first walked through I could place every piece of my furniture,” says Denise. 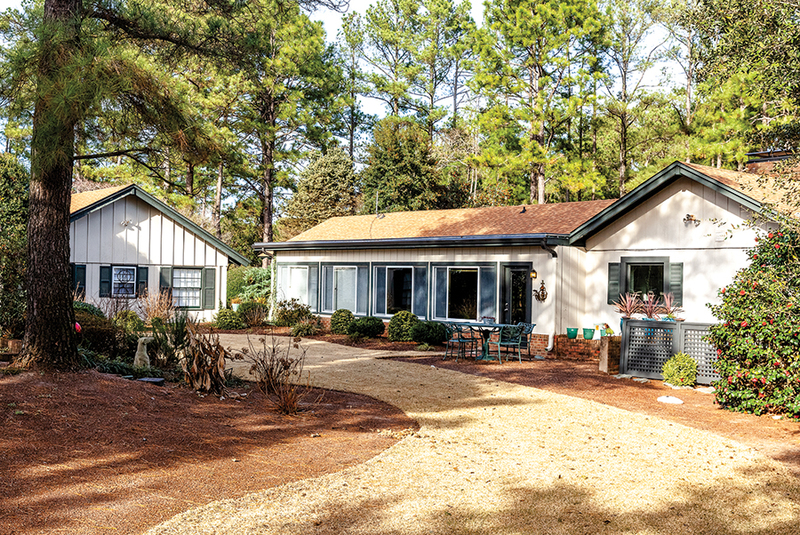 She purchased the property — which had seemed too big before Lindsay’s B&B proposal — in 2012. Such was the post-party state Denise faced: dark wood paneling, dated carpet and tile floors, “very masculine,” her take. But nothing could take away from looking out oversized windows at her grazing horses. As with most farm-style houses, this one centers around the kitchen, the only room Denise gutted. 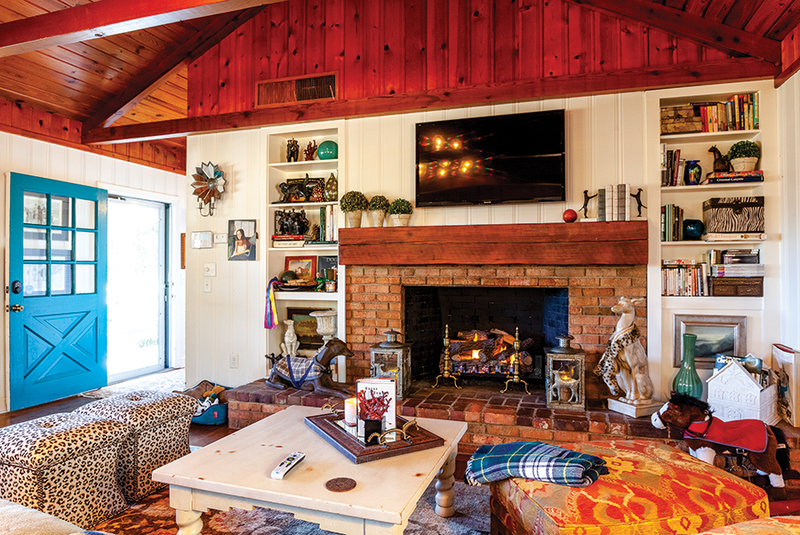 She especially liked the raised brick fireplace with a slab mantel cut from a local tree and the vaulted wood-paneled ceiling, which she left intact. Other paneling is now painted shady white. 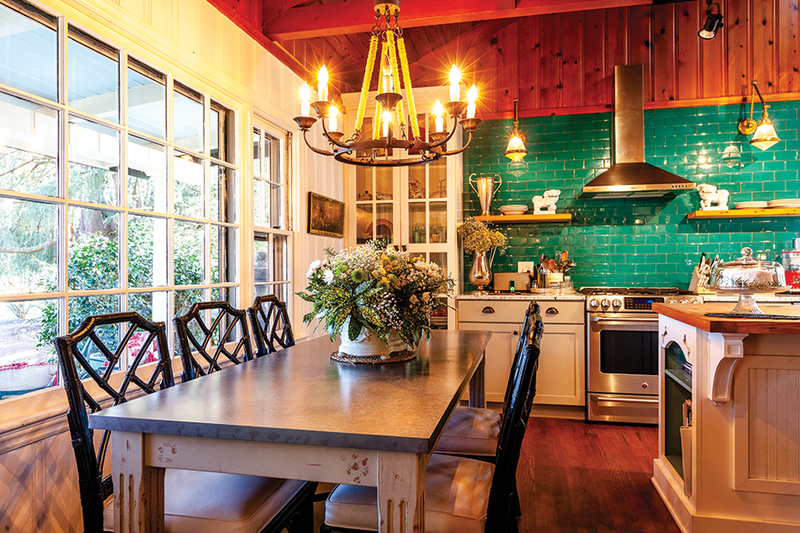 Between the fireplace and the equally massive island with a top made from reclaimed wood joined by pegs is a small sitting area with two overstuffed chairs, upholstered in unlikely smoky-turquoise velvet reflecting the opposite kitchen wall of turquoise ceramic tiles. Red countertop appliances provide pop. Following the trendy farmhouse modern mode, Denise replaced some hanging cabinets with single shelves that hold a few artfully placed dishes. Over the sink, a picture window with sightline to the upper barn where she and Lindsay keep two horses. The long family dining table stands at the front window facing the paddock. Its legs resemble a pencil, shaved to a point. Rather than family heirlooms, Denise’s furnishings, all chosen with a designer’s eye, arrived via High Point. They own no particular style but co-exist amicably with each other and ceramic dog-base lamps, paintings of her schnauzer Brody and other animals. Nowhere is Denise’s ability to juxtapose better displayed than the living room, also with a fireplace, where a vaulted pine ceiling (think ski or hunting lodge) synchronizes with a turquoise velvet sofa, leopard-print ottoman-tables, colonial corner cupboards, built-in bookshelves. Denise doesn’t miss a detail. The living room window looks out onto plants arranged on a window-height table on the wide front porch. This effect brings outside in, inside out. Extending back from the kitchen, a hall and huge porch have been joined, enclosed and repurposed as a dining room and, without any divider, an office. “I needed a dining room and I needed an office,” Denise explains, while admitting that the office end, with turquoise desk, is used primarily for paying bills. 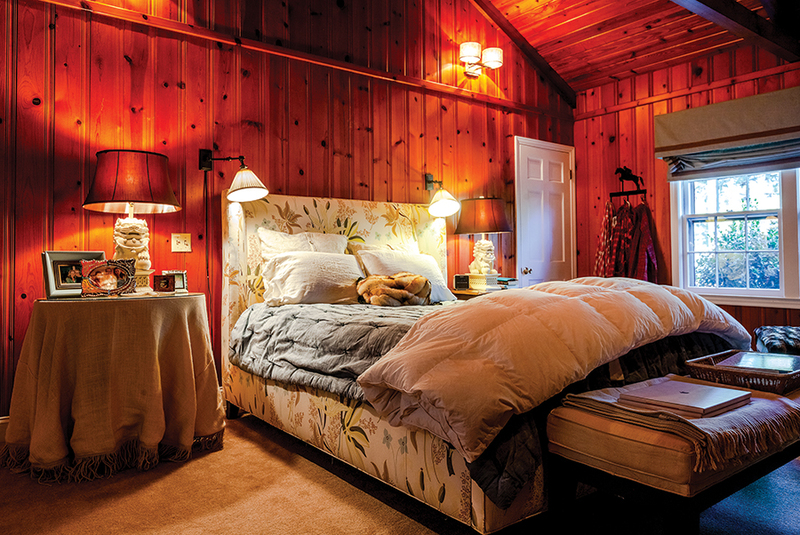 Two guest bedrooms line the hall, with her master suite at the end. Here, surprisingly, she has not painted the wood paneling. “It’s cozier this way.” Again, turquoise and complementary colors, just enough family photos and animal art. They are also everywhere, providing a palette of colors played out in upholstery and drapery fabrics. 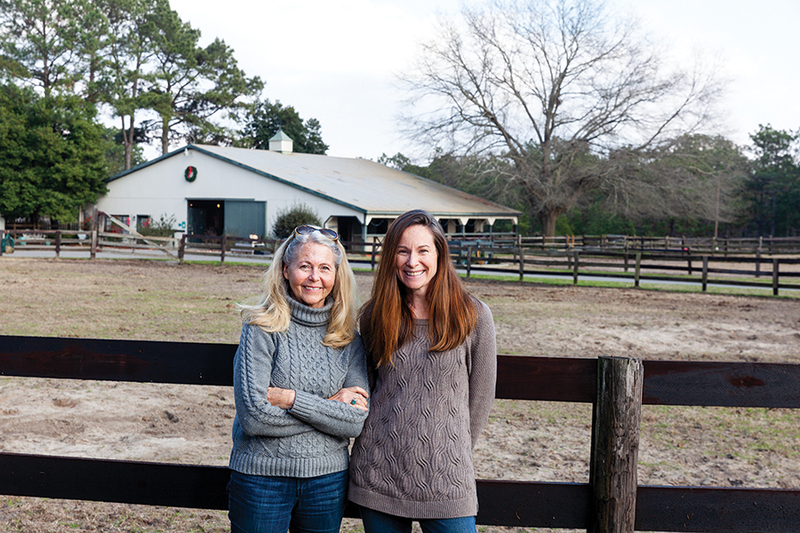 The sticks and stones may be pretty but central to Tanglewood Farm is the mother-daughter relationship. Lindsay hasn’t lived at home since she was 17. After relocating to Southern Pines she first lived downtown, which meant lots of back and forth while managing the units. She and her husband recently built a home a few steps away from Denise’s renovated farmhouse. Boundaries aren’t a problem; they share some B&B duties (including both the dirty work and preparing unusual breakfasts), visit back and forth frequently, eat together occasionally. Lindsay’s 4-year-old son, Flynn, is a regular at Granny’s, but since he and a younger sister have a full-time nanny, babysitting isn’t part of the equation. “At least if something happens there’s somebody to call,” says ever-practical Denise. Since several of the B&B units border the owners’ patio and garden, guests intermingle, become friends and return. None of this was planned, by mother or daughter, yet Denise recalls thinking how nice it would be to have a family compound, where all three of her children could gather.